1. Books Which exclusively deal with Framework and the Base Classes. 2. Second are general purpose books which give very little detail on Framework but give more weight to implementation. 3. Special purpose books which deal with Custom Control Development or ADO.net etc. This book has close to 75% of its focus on type1 and 25% on type2. Part1 gives a heavy weight introduction to the framework and PArt2 about c# and OOPS. Part3 has excellant chapters about Base Classes, Transactions and collections. I would have even preferred if PAtrick had skipped other chapter in Part 3 except for the chapters mentioned. But Part1 and Part2 is just worth the price of the book. This is an one stop shop for experienced Java and c++ programmers who are trying to know Dot Net and want to have some basic understanding on how to implement them. Existing Dot Net Programmer who has very little knowledge fundamentals of the platform or c# can also be helped by this book. Kudos to Patrick when there are many cookie cutter books he has come out with a book with deals with indepth knowledge and fundamentals of Dot Net. With the arrival of .NET 2.0, I realized that my knowledge of the .NET platform needed some updating. In my quest for a good resource, I came upon this excellent book. It is made up of 3 parts divided in 24 chapters. The first part covers the .NET 2.0 platform, things such as CLR issues, threading, application build and deployment, security or interoperability with unmanaged code. This part is clear and to the point. I think it is worth the price of the book alone. The second part is on the C# 2.0 language. The description of all facets of the language is dense and detailed. For example, the author compares C# 2.0 anonymous methods and functional closures and explains how .NET generics work under the hood. The third part covers the .NET 2.0 framework as a whole (generic collections, ADO.NET 2.0, System.IO, System.Transactions, XML, Windows Form 2.0...). I appreciate the fact that each chapter provides great added value over the MSDN. The chapter on ASP.NET 2.0 is an excellent reference and the way it is organized makes it easy to understand how things really work. The Appendix B references all .NET 2.0 new features covered throughout the book and has been an invaluable source for me. This book was a pleasure to read. It is written effectively and concisely and all the code examples in the book are well structured and complete. 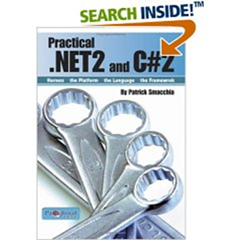 Compared to other .NET books I have, the author did a superb job of collecting information that really matters. It met all of my expectations and I recommend this book to anyone interested in using .NET 2.0 for development.